It must be clear that if Iran does not cooperate with the West on the nuclear issue, military confrontation will be unavoidable, incoming Israeli ambassador to Britain, Ron Prosor, was quoted as saying Sunday. 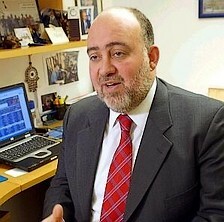 Israeli ambassador to Britain Ron Prosor. Prosor, who served as Prime Minister Ehud Olmert's senior adviser on Iran, told the Sunday Telegraph that Teheran could enrich enough uranium to make an atomic bomb by 2009. "At the current rate of progress Iran will reach the technical threshold for producing fissile material by 2009," he told the British newspaper. "This is a global threat and it requires a global response. It should be made clear that if Iran does not co-operate then military confrontation is inevitable. It is either co-operation or confrontation." Prosor went on to say that the Iranians would soon be able to fully control all the elements of enrichment and from that point on, it would only be a matter of time before they had a nuclear weapon. "There needs to be full verification of what is happening in Iran," said the Israeli ambassador. "In Israel there is a belief that the Iranians are continuing with their nuclear weapons program." Prosor expressed astonishment over Washington's latest intelligence assessment downgrading the Iranian threat. However, he said that the report contradicted Iran's claim that its nuclear ambitions had always been peaceful by confirming that the country had run a weapons program, even if it was now frozen. Prosor also said that the assessment showed that Iran was continuing to enrich uranium. "If we take the report at face value then we must conclude that the UN sanctions have had an effect on Iranian decision-making. It is important to keep up the sanctions because they are working," said Prosor. He said Iran's nuclear ambitions were like "an express train traveling at high velocity to reach its destination at the end of the tracks", while the diplomatic train to convince it to give up its activities was like a "slow train that stopped at every stop while some people get on and others get off." In the Telegraph interview, Prosor questioned Iran's need for a nuclear program given its vast oil wealth, adding that Teheran was trying to undermine US President George Bush's attempts to revive peace negotiations between Israel and the Palestinians. "This is the beginning of a process that we hope will result in two states, with two peoples living side by side in peace and with secure borders," he said. "They will do everything they can to derail any progress that is made between the Israelis and Palestinians." Meanwhile, a British intelligence official said that Iran had deceived the CIA over its nuclear plans and expressed doubt that Iran had indeed frozen its atomic weapons program. The official said British analysts believed that the Iranians, knowing their phone conversations were being listened to, deliberately gave misinformation. "We are skeptical. We want to know what the basis of it is, where did it come from? Was it on the basis of the defector? Was it on the basis of the intercepted material? They say things on the phone because they know we are up on the phones. They say black is white. They will say anything to throw us off," the official told the Telegraph. On Sunday, a Security Cabinet panel is set to meet to discuss the new US intelligence report.